Manchester’s contribution to music needs no introduction but what’s less well-known is the role that Stockport played in bringing it to the masses. I recently popped into a brilliant exhibition at Stockport Museum that recounts the story of one of the UK’s first professional recording studios outside London. Strawberry Studios: I am in Love covers the studio’s complete history – its origins as Inner City Studios on Underbank, its rapid growth following investment from the likes of Eric Stewart and Graham Gouldman (who would later go on to form 10cc), its relocation to Waterloo Road, its renaming after Stewart’s favourite Beatles song Strawberry Fields Forever, and finally its closure as a recording studio and conversion into offices in 1993. I’ve been thinking a lot about Strawberry Studios lately having just started a new job as assistant editor of a magazine called Supper. Its office is based in, you guessed it, Strawberry Studios. 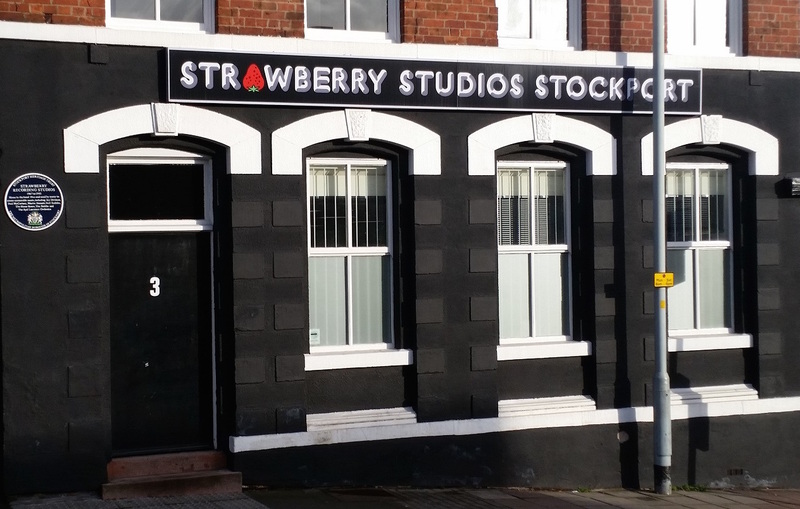 The building’s recently been given a makeover to better reflect its musical heritage, which includes recreating the famous ‘Strawberry Studios Stockport’ sign and updating the blue plaque outside. The offices within aren’t open to the public (they’re home to various magazines as well as a data research consultancy and even a radio station) but there are plenty of nods to the past such as meeting rooms named after stars with links to Strawberry Studios – Morrissey, Marr, Hook, Curtis and so on. What’s more, the distinctive wide-angle window that once linked the rehearsal space with the studio control room is still there to this day. Strawberry Studios: I am in Love runs at Stockport Museum until 28 February 2018. Free entry.